Mordu's Legion was formed at the end of the first Caldari-Gallente war by exiled Intaki who sympathized with the Caldari during this conflict. Despite that they only formed at the end of the war, by the time it was over, Mordu's Legion had achieved a legendary status due to their achievements during the war. Despite this, they had trouble settling within Caldari society, resulting in an uprise by nationalists, targeting the Intaki from Mordu's Legion. With help from the Caldari Navy, the uprising was suppressed. Following this they decided to reside in a system of their own in the Pure Blind Region, but with support from the Caldari, as a favor for their successful military support. However, the rise of Capsuleer tech saw them competing with these immortals. Lacking the advantages capsuleers have, Mordu's Legion ships usually came out on the losing side when they had to face them... Add to this that due to their work with criminal organisations, Concord and the other nations branded them as pirates, to be hunted down in exchange for a bounty. Yet, due to the unique nature of the members of Mordu's Legion, mainly Intaki who sympathized with the Caldari cause, they managed to be crucial in defusing explosive situations between the State and the Federation in recent times. We'll highlight two of these mercenary contracts that helped to keep tensions between the State and the Federation in check. After the Concord Militia act, Intaki Prime fell into the designated warzone between the Federation and State. During this 'regulated' war, the Federation failed to halt the occupation of the system by the Caldari State. However, Ishukone, who won the auction to oversee Intaki development, understood that letting the Caldari Navy occupy the system would only lead to uprise and fanatical Federation pilots opposing the Caldari. In a deal struck with the Intaki authorities, Mordu's Legion was contracted to protect and defend the system and it's inhabitants from aggressors. Initially, the Federation did not recognize this authority, and tried to fight off Mordu's Legion forces with help from capsuleers employed by the FDU. However, the Intaki assembly confirmed Mordu's Legion was deployed on their request as well, even refusing the Federation Navy to enter the system to overtake security. 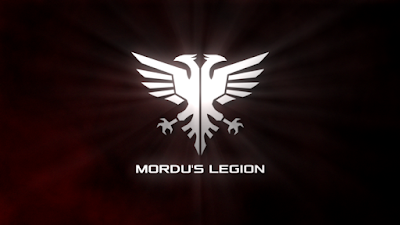 The deal with Mordu's Legion includes that neither the State nor the Federation is allowed to send military ships to the system as long as Mordu's Legion is under Intaki contract. They have been given full authority to police the system and have been given full military access. During this, Mordu's Legion only has to answer to the Intaki assembly for orders and reports concerning the security of the system. Due to this contract, Intaki Prime enjoyed relative stability, despite Caldari and Federation forces regularly switching 'official' control of the system under Concord regulations. No matter who 'owns' the system, Mordu's Legion remains in control to police the system and assuring military security. After the battle for Caldari Prime, it was quickly realized that neither the Caldari Navy nor the Federation Navy would be acceptable to provide orbital security for Caldari Prime. It had to be a third faction, but one accepted by both sides. After their outstanding work in providing security at Intaki Prime amidst a warzone, Mordu's Legion was seen as a logical choice to take up this security contract. Mordu's Legion has been contracted to be the sole policing force in orbit of Caldari Prime. This means that no-one but Mordu's Legion has military jurisdiction rights in the Caldari Prime DMZ. This was found to be the most acceptable by the State and Federation, to prevent accusations of bias. It's thanks to contracts like these that tensions between the State and Federation haven't escalated into a full blown war. Mordu's Legion provides a good military alternative in places where stationing conventional military forces from either State or Federation Navy would cause a situation to escalate into a shooting conflict. In order to combat their diminishing relevance on the public mercenary market that's now overtaken by capsuleers, they have released entirely new ship designs. These new ships are remarkable as that they are designed from the ground up to be compatible with capsuleer technology! This is a drastic change from their old stance, where they preferred ships with a bridge crew instead of a capsule. It is believed this change was enforced on them by the realisation that capsuleers are just that more efficient in mercenary work. In order to keep up, they had to adopt this technology as well. Looking at these new ships, they succeeded beyond expectations, as these ships have been built with the capsule in mind! With these new ships, Mordu's Legion hopes to retake their position on the mercenary market, helped with the deployment of the advanced technology they can access from both the State and the Federation. Add on this their recent recruitment drive after Heth's ousting and the disbanding of the Providence Directorate, and it looks like the Legion plans to be one of the big players on the mercenary market again. One of the ways to put out their name again is by thwarting Gurista research. Mordu's Legion has deployed ships everywhere in low sec to locate and retrieve Gurista research files in order to uncover what they are working on and to locate their main research facilities. In addition to this, the Legion also attempts to retrieve research-data the Guristas have stolen from them. They have asked capsuleer assistance, rewarding them with advanced technology if they turn in any Gurista research data they find. Through this, Mordu's Legion achieves two goals, one: they become known among the greater community again, making them visible for new contractors, and two: they thwart the Guristas in their research. This is important as the Guristas have been in the news more often concerning their covert research projects.